We have begun to explore the fact – question – inference continuum using non-fiction books and information storybooks. This process is inspired by Adrienne Gear’s Non-Fiction Reading Power book. When we learn a new fact, what question does it prompt and using our background knowledge (schema), what can we infer? We practiced this today using Jim Arnosky’s Crocodile Safari. This is a detailed account of American crocodiles. Crocodiles were photographed and sketched while Jim Arnosky and his wife Deanna were on their crocodile safari through the Florida Everglades. This book is illustrated with the detailed paintings inspired by the images collected on safari. Stunning! Today we read about a third of the book learning about the crocodile population in the U.S.A., the differences between crocodiles and alligators (finally, a book that makes this totally clear through text and drawings! 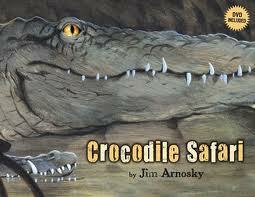 ), crocodile habits and hunting strategies (a page called Ambushed from Below was quite thrilling!). 1. We read that in the late twentieth century there were just 300 crocodiles left in the U.S.A. Now there are approximately 2,000. This led us to question: How were they counted? As we tried to answer this question, more questions arose. What if the same crocodile was counted more than once? Maybe they tagged them. But if they tagged them, how would they get close enough to tag them? We were all fairly worried about those sharp teeth! Perhaps they shot tranquilizer darts at them to put them out long enough to attach a tag. Obviously, some of our background knowledge was helping us think this through. We read on and found out that they were counted when someone flew over their habitat in a helicopter. Students shared new learning, unanswered questions and some of their own inferences in their writing. Jenny: I learned today that the difference of a crocodile and an alligator is that the crocodile has teeth sticking out of its mouth when it’s closed and an alligator doesn’t. A crocodile’s mouth is longer and an alligator’s mouth is wider. Eddy: At night crocodiles hunt. In the day, they like to suntan. They mostly eat fish but they also eat birds and snakes. Lisa: I have a question about how they communicate with other crocodiles. Maybe they move their tail back and forth in the water. Jena: Crocodiles eat anything they find. They ambush their prey. They go underwater at night (mostly) to hunt. They rise up to the prey and pull it down and eat it. For example, if you saw a duck and then it just disappears. That’s what just happened to it! Gary: There are questions I still have. How heavy are crocodiles? How big are alligators? Are alligators stronger than crocodiles? This entry was posted in Non-fiction and tagged asking questions, endangered animals, great read alouds, infer, Jim Arnosky, non-fiction, schema by carriegelson. Bookmark the permalink.